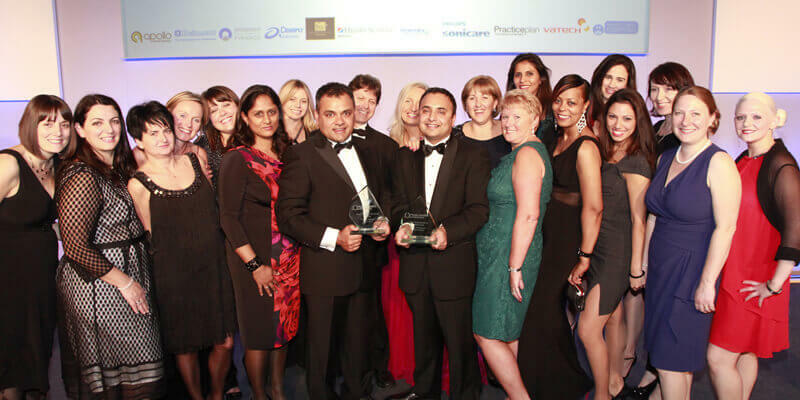 A Specialist in Endodontics is a dentist who has undertaken postgraduate specialist training in the discipline of Endodontics. Hence, Dr Gluckman has developed the special (or necessary) skills required to diagnose and treat the more difficult (or complex) and challenging cases. In addition, some treatments present technical challenges that can more readily be met with specialist equipment not routinely available in general dental practice. Your first visit will be a consultation, where we will discuss the treatment proposed by your dentist. Following a detailed history, a thorough examination will be carried out specific to the problem site. Subsequently, we will discuss his findings with you and inform you of the treatment options available. We will ask you to complete a medical history questionnaire when you arrive, so please arrive 10 minutes prior to the appointed time to facilitate this process. Please bring the names of any medication you may be taking along with the contact details of your GP. 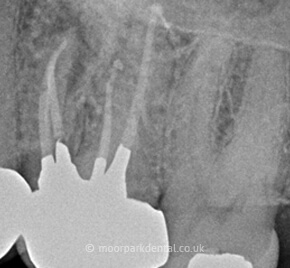 When possible and with your consent, first stages or the entire root canal treatment can be carried out at this visit. 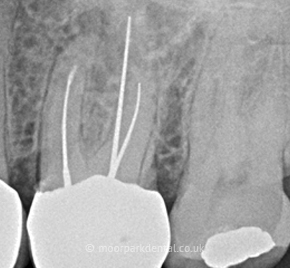 Endodontics is the branch of dentistry which aims to treat disease affecting the dental pulp. 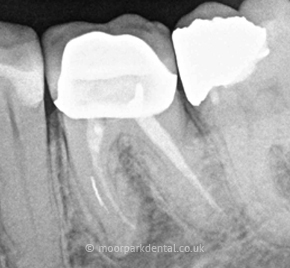 The dental pulp is the sensitive soft tissue located in the centre of the tooth within the root canal system. It is broadly composed of nerves and blood vessels. This is one type of endodontic treatment that serves to prevent or treat disease in the tissues surrounding the tooth (jaw bone), when the pulp is diseased or has died. A small hole is drilled in the centre of the tooth to allow removal of the pulp and/or disinfection of the root canal system. 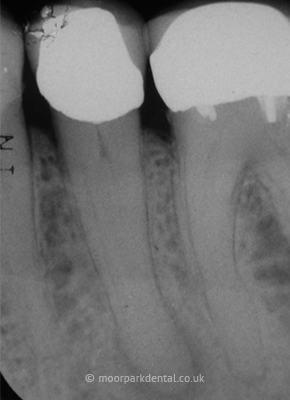 Subsequently, the root canal system is filled to prevent reinfection. When the pulp becomes diseased or dies, it can remain pain-free or there can be associated pain (of varying degrees) and swelling (abscess). Root canal treatment aims to render the area disease and pain-free. Without treatment, the infection could progress even in the absence of any pain. 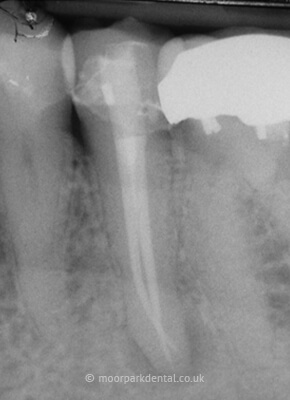 The alternative to root canal treatment is to remove the entire tooth. Root canal treatment will therefore help to retain the tooth in your mouth preserving your appearance, allow you to chew with comfort and maintain neighbouring teeth in their position. The alternative to root canal treatment is extraction followed by no replacement or replacement with a removable partial denture, bridge (fixed or adhesive) or an implant. Once treatment is completed, you return to your dentist for a definitive restoration. 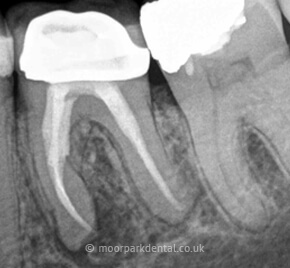 This may involve the placement of a crown to protect the tooth and restore it to full function. You would be recalled after 6 months to 1 year following treatment to monitor the extent of healing. Endodontic treatment and the restoration of your natural tooth may be less expensive than the option of tooth extraction and replacement with a bridge, implant, or removable partial denture. The cost will vary depending on the nature of the problem and the tooth affected. An estimate of the cost of your treatment will be provided on the day of your consultation. Payment is expected at the end of each visit.